Maria (Catalina Cuervo) and that DRESS. As we've said before, Mill City Summer Opera provides one of the most unique and special experiences in local theater. Fabulous music in a gorgeous setting makes for a not-to-be-missed experience for theatergoers. This year, due to the repairs at the Mill City Ruins Courtyard, their summer show has moved to a historic industrial spot in Northeast Minneapolis called the Machine Shop. 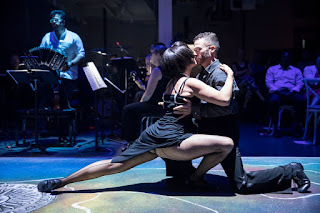 This hip venue turns out to be a perfect setting for Maria de Buenos Aires for this intimate opera-tango-drama, with its urban feel made even more atmospheric by a heavy layer of fog, adding a sultry feel. The work is more of an oratorio than an opera. Written in the key of “Ay! 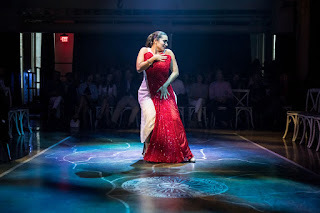 minor” (Ferrer’s libretto is laced with musical puns), it’s a Passion play in which the central character, María, represents both Jesus and the Virgin. She sleepwalks through scenes of sexual violence, her burial and dreamlike confessions to a chorus of psychoanalysts until, resurrected, she gives birth to a new version of herself. So THAT's what happened! The performers are uniformly excellent and inhabit the roles as if they've played them many times before--which they have. The main actor/singers have played these roles multiple times and do so beautifully. 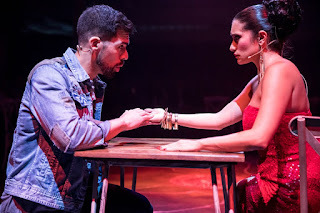 The voices of Maria (Catalina Cuervo) and Payador (Luis Alejandro Orozco) are rich and gorgeous, and El Duende (Milton Loayza) narrates the action with the perfect mix of menace and sadness. Also, noted in the program as one of four main cast members is JP Jofre as the Bandoneon player. Hey, what's a bandoneon, you ask? Here's some info that the very musical among you may understand. All I know is that it creates a beautiful sound and watching Jofre's expressive performance was one of the great pleasures of this show. See that guy in white? That's the star of this show, JP Jofre. I was also delighted to see Brian Sostek and Megan McClellan among the stylish dance ensemble, who apparently did a lovely marionette routine. Here's the sad news. Theatermaking friends, can I remind you that when you put action on the floor with the audience on risers, sightlines can be challenging. Although we could see most of the action beautifully, as soon as the performers dipped to a certain level, the audience was leaning and straining to see the action. We missed the last scene with Maria entirely and couldn't see the beautiful sparkly dress she was wearing, much less what she was doing. But in total, Maria de Buenos Aires was atmospheric, delightfully site-specific, with amazing performers and gorgeous music. As usual, Mill City Summer Opera is creating unique, engaging theater and is an utter delight. Also as usual, this is a short and sold out run, so put Mill City Summer Opera on your list for next summer!